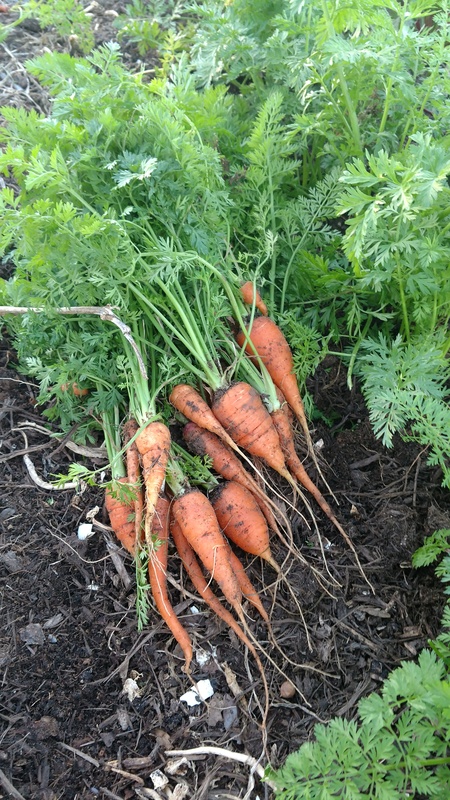 Although the harsh freeze (down to 19 degrees Fahrenheit) damaged much of the Fall/Winter garden, these carrots survived and we are now enjoying the benefit of covering them with frost cloth and tarps! Carrots — like everything else in the garden — are best when cooked or eaten fresh. So, we usually leave them in the ground, picking only what we will consume in a few days to a week. We do this by “thinning” the thickly planted carrots. The green tops are removed and fed to the horses that have eagerly migrated towards the garden side fence in hopes of a treat! So far, we have picked about 5 to 7 pounds, with another 5 pounds or so still in the ground. Once the carrots begin to go to seed, they are all pulled.